Today: A mashup of all the best pasta sauces -- tomato, asparagus, and carbonara -- with surprisingly harmonious results. 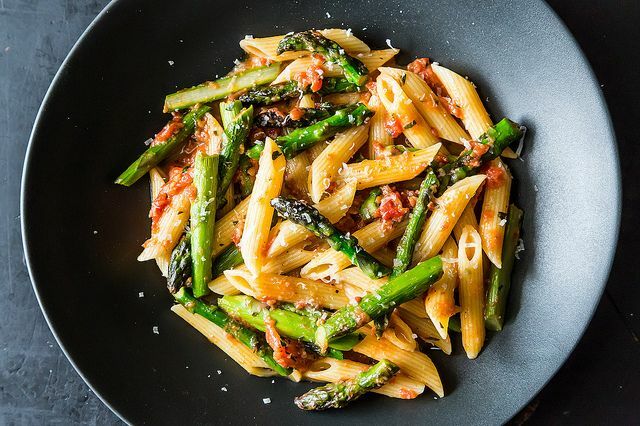 Despite (or maybe because of) a sluggish spring, you've probably already been hitting the asparagus pretty hard -- blanching and feathering it, slipping it into your pasta under pools of ricotta. But have you had it with tomatoes? Doubtful, because that would be goofy. Tomatoes are born in August, asparagus in May. Their biological clocks weren't designed to go together. 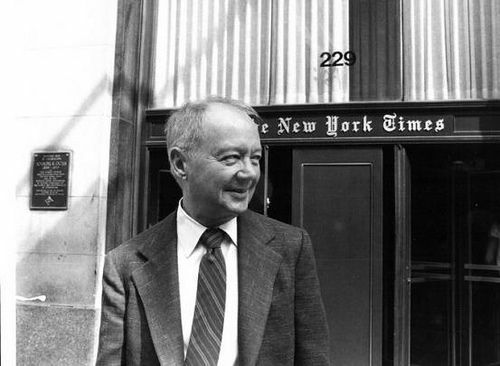 But Craig Claiborne was too clever a cook to follow the easy paint-by-season path to recipe development, matching peas with asparagus and tomatoes with sweet corn. He knew how to clash, gracefully. 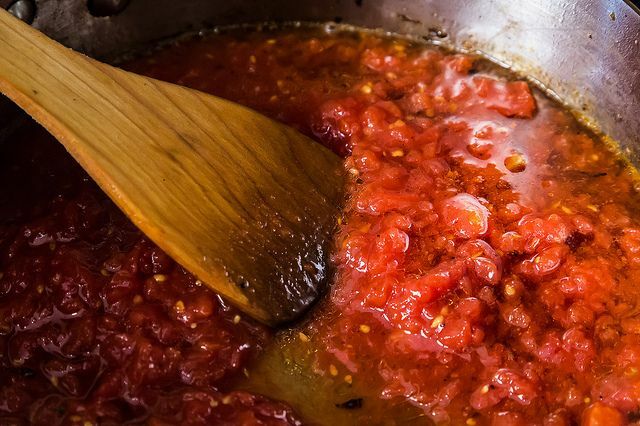 Thankfully, we've learned to salvage tomatoes from late summer and give them eternal life in cans. And while they'd be of no use in a caprese, they have every right to be in sauce all year long. Even with asparagus! Its grassy pop is surprisingly at home in a bed of sweet-sour tomato sauce, mellowed with a last-minute addition of beaten eggs, à la carbonara. Oh, you haven't done that either? 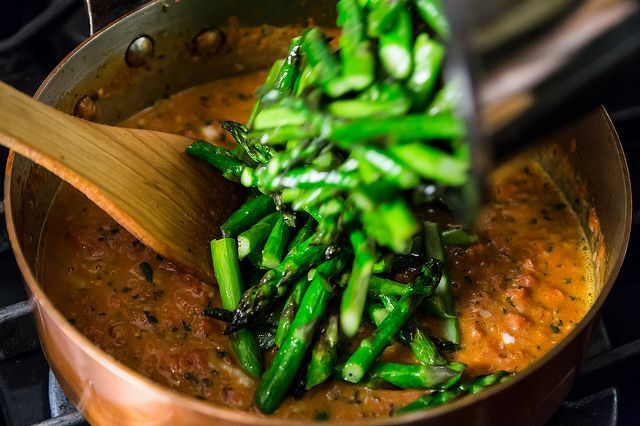 Beaten raw eggs into your tomato asparagus sauce? Well, it's about time. 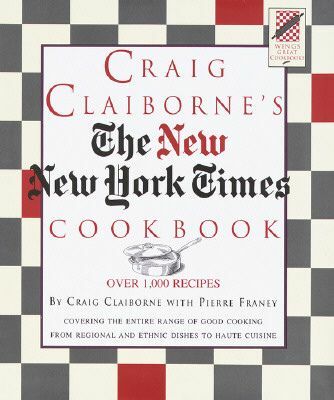 (Claiborne was doing it in 1979 -- we're behind!) A little egg pulls the sauce together, glossing it up without muffling it like heavy cream would do. 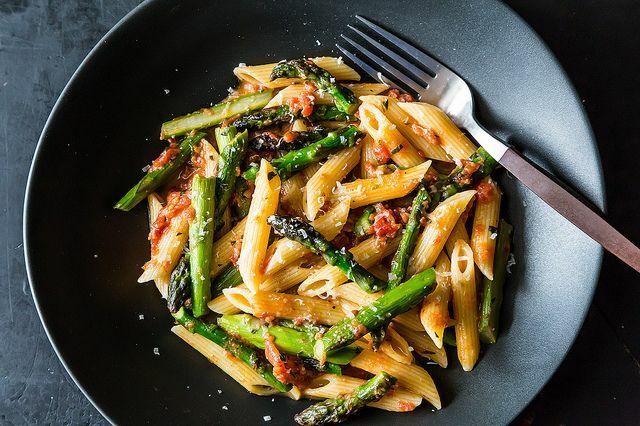 Maybe the most genius part: As Food52er monkeymom pointed out when she sent me this recipe, this is essentially a highly adaptable pantry pasta supper, with addition of fresh asparagus (which is sort of a staple this time of year anyway). But by rearranging your pantry staples just so, dinner turns out elegant and new. So go on: break free of the season. Clash a little. This recipe was tasty, if maybe a little flat. I would suggest a high quality aged parm to keep it on it's toes. And while I love a hearty meat free meal, I have to admit that after a bite or two my mind went straight to pancetta. And maybe (call me 90s) a few sun dried tomatoes. Perhaps they are using the amount of pasta that should be a serving instead of what we often use as a side carb. I recently got some isobo noodles with some veggies at Costco and each package inside the box is supposed to be 2 servings and the sodium is sure too much at 750 per serving. However, it is so easy to finish off the whole bag for one person which is way too much sodium at 1500 grams yet the amount tastes like one serving. We need to cut down on our carbs except for veggies and fruit. My husband and I use about a half box (half pound) and we always have enough for leftovers at another meal. There are small packages probably a half pound, a pound and a 2 lb package, I believe. Need to make sure of the pounds or ounces uncooked. I love the concept of this recipe and the asparagus sauteed in butter was really the pièce de résistance. I would note to be cautious of the amount of egg - I found the 2 + 1 yolk to be a little too much. I added an extra grind or two of pepper to give it that really peppery bite that traditional carbonara has. My husband and I both felt like the finished pasta was missing something and that was using someone's idea of crisped pancetta. Not bad but not all that exciting. I tend to use quite a bit of freshly grated parmesan...sort of inline with the idea of the carbonara. This recipe looks great. But I have a gripe. It calls for 3/4 lb. of pasta. Pasta comes in 1 lb. bags or boxes and if you're making pasta, why not make the whole box? There are 3 of us in our family, one of whom is a boy on the cusp of adolescence who eats everything in sight. So it would be great if I could make this recipe without having to adjust all the ingredient amounts in order to make a whole pound of pasta. I wonder if anybody else feel this way? Steve, I had similar doubts about the amount of pasta (3/4 lb for 8 servings?). Frankly, if you just use the whole box it wouldn't make a big difference. Maybe add a bit more tomato and one more egg. Thanks, Blork, I'll do that [tonight, in fact!]. But my comment was a bit more general. It seems a lot of pasta recipes call for 12oz (3/4 lb). Life would be easier, at least in our house, if all recipes just use the box amounts. I hear you -- was pasta sold in different increments in 1979? Or maybe Craig was buying it in bulk in Little Italy. I totally agree with Blork's suggestion. 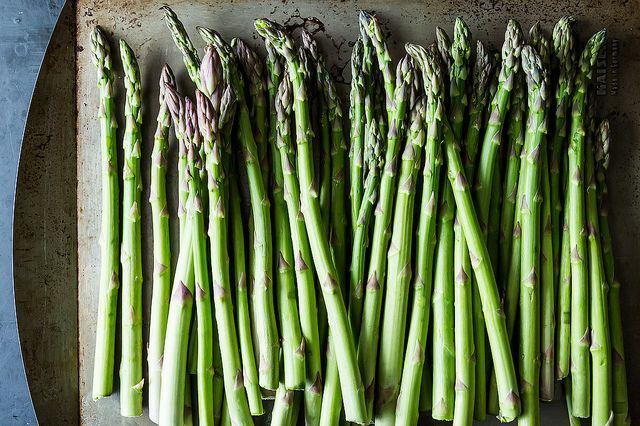 I have several pounds of wild asparagus just waiting for fabulous recipes like this! Made it this evening as an accompaniment to grilled wild salmon; decided to follow the recipe to the letter rather than innovate right out of the chute; it was wonderful! Grazie tanto, Food 52! 1) I'll be the addition of a small amount of crisped pancetta or crisped prosciutto would just knock this out of the park. 2) I'm a bit curious about the quantities. This is labelled as a recipe for 8 but it only uses 3/4 lb (340 g) of pasta, which is what I'd use for four servings. 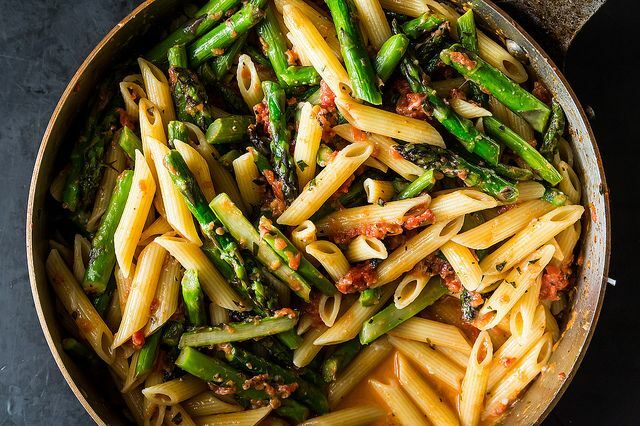 On the other hand, there's a lot of asparagus in there, so if you think of this as an asparagus dish that has some pasta in it (as opposed to a pasta dish that has some asparagus in it), it might make sense. In my case I'm making it for four, so I will cut everything in half except the pasta, for which I'll probably use 300 g.
That should be "I'll BET the addition of..."
UPDATE: I made this tonight and it was really good! Quantity-wise, I used about a pound of asparagus, but after trimming the stumps it was probably about 3/4 lb (340g). I used about 10oz of penne (275g). 1 egg plus one yolk. Everything else was pretty much half the original recipe (although I used the full amount of fresh herbs). It made four "reasonable" portions. Regarding the crisped pancetta/prosciutto, I'm not so sure now, as the recipe was spectacular on its own. If I were to add some, it would be a small amount sprinkled on at the end like a garnish. This looks so freaking good. Can't wait to try it. This looks delicious...can't wait to make some...YUM! Ah! So glad to see this! The photos looks so good, I absolutely have to make this again right away. I was wondering if there was a way of sharing recipes on FACEBOOK? Looks so yummy! I will have to try it! This looks amazing! However, I can't have raw eggs. Is there something I can use as a substitute to maintain the consistency or is it fine just to go without? Thanks!!! Just guessing, but if the idea is to thicken and gloss up the sauce, a scoop of pasta cooking water (for the starch) and a pat of butter would probably be a good alternative. 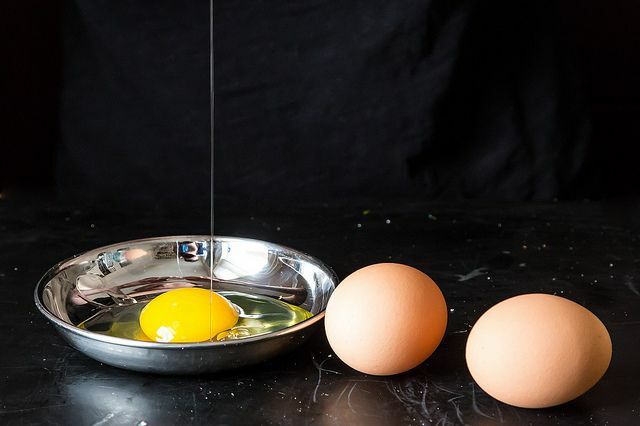 Could you eat pasteurized eggs? They are fairly common in grocery stores here, the brand I use is "Safest Eggs." I use them whenever raw eggs are specified in a recipe. If not, I would just skip the egg. I think that a bit of cream or butter will help tamp down the acid the way the egg does, but won't bind it the same way. That part of it is really unique. The heat of the pasta and sauce will cook the egg. It just needs to be raw going in so that it doesn't clump like scrambled eggs, instead it coats the pasta. I'd be careful with that. While people commonly say that adding raw eggs to cooked things then "cooks" the eggs, I don't think that's 100% accurate. 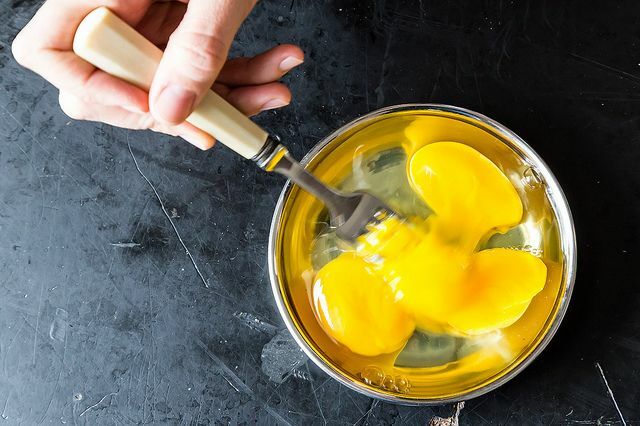 It certainly warms the eggs, but there's no guarantee it brings the eggs up to a temperature that is hot enough to "cook" them to a level that makes them safe for someone who is at risk if they eat uncooked eggs.